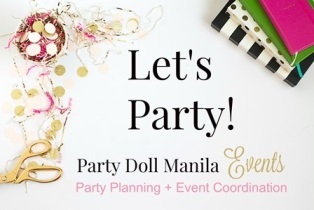 It’s always a breath of fresh air to encounter a one-of-a-kind party theme that makes us go giddy and excited for its, well, uniqueness. True enough, something popped in our mailbox today that sent our dainty hearts a-flutter: a delicate hot air balloon-inspired affair. Churned from the creative minds of Confetti Parties MNL, the heavenly fete of Elisse Sabina, or Saab, was styled in shades of light pink, gray and white. Of course, the charming celebration was captured through the lenses of Mhel Mesa Photography, quite known for her bright and cheery snaps. So, hop onto that hot air balloon to see what’s more in store for this chic celeb. As Saab marked her first year milestone, it’s only fitting to say that she’s just about to start her happy adventure in life. And what better way to cruise through it but aboard a hot air balloon! Guests were welcomed with a pastel-colored installation of what to expect once “The Adventure Begins”. Snow-capped mountains were also included to complete the set. Hmm, does the expression “Sky’s the limit!” applicable here? Don’t forget to take a snap or two in front of the charming spot! Look up and spot the Japanese paper lanterns in baby pink, white, and gray representing the hot air balloons. Check out the tiny buntings that add an adorable flair to the décor! We’re this close to squealing in delight with the stage set-up because it was such a darling sight! The hot air balloon was made up of balloons in shades of gray, pink, and white, such a lovely color combination indeed. Whimsical details such as the charming whitewashed bench with a blanket and pillows added a bit of easy-breezy vibe. It was such a scene-stealer! True to the theme, each table was decorated with a single, miniature hot air balloon draped with charming buntings and set against tufts of clouds. Are we on cloud nine? The sweets spread set-up was an eye-candy as well! White balloons festooned the table, and set amidst the background of “Up, up, and away!” that’s just too dreamy to dismiss. They say that three’s a crowd, but in this case, all good things come in threes! In fact, there’s a trio of one-tiered cakes to celebrate li’l Saab’s first year. Done in ombre hues of peach, pink, white, and gray, the charming frosted and naked cake confections were so in line with the darling party theme. And if guests prefer smaller bites, there were cupcakes for the sweet-toothed ones! The pink and yellow icing atop vanilla cupcakes were too heavenly to chomp on. Guests were treated to carts of ice cream and juices. Of course, the goodies-on-wheels were thoughtfully spruced up according to the dainty theme. So adorbs, might we add! A kiddie party ain’t complete without prizes, of course! That’s why Saab and her family prepped an amazing array of loots for the young ones, and we agree that it’s hard to just pick one! Aside from the prizes, guests took home pillows bedecked with hot air balloon prints. Feels like heaven, isn’t it? Darling Saab and her family sure had a great time celebrating her first birthday with a dreamy and wonderful celebration. After all, she’s now ready for her next big adventure called life.